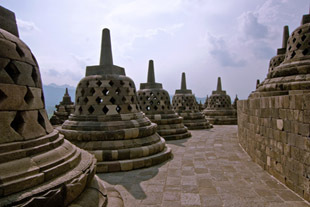 Borobudur, located in Magelang of Central Java, Indonesia, is said to be the greatest Buddhist stupa. A stupa is a mound that is filled with Buddhist relics. 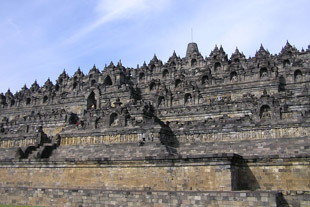 Borobudur was built before 800 A.D. It is known for its decorations, statues, exceptional up keeping and conservation. It is one of the world’s most complex buildings. The Borobudur stupa is very large and rests on a hill. The sculptures inside represent a solar model of the universe. One can walk through five kilometers of open corridors. Visitors start their journey from the base of the temple and move to the third and highest level where there are 72 statues of the Buddha and a large monument. The walkway leads to a small downhill area and through six square and circular terraces. The stupa is adorned with 2,676 panels and 504 Buddha statues. 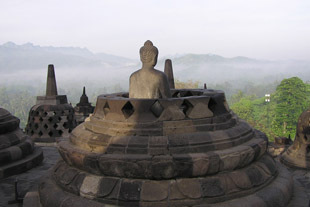 Borobudur is not only a shrine, but also dedication to Buddha. The Borobudur site is now owned by the United Nations Educations, Scientific and Cultural Organization (UNESCO) and the government of the Indonesia. Some signs suggest that this site was abandoned in the 14th century. 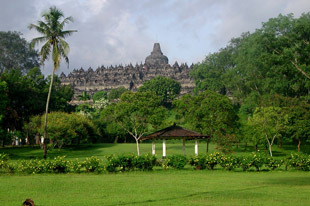 This is one of the most visited sites in Indonesia. One of the main reasons why many of visitors come to this place is to see the giant sculpture of Buddha. We are Master students of National Taiwan University of Science and Technology. We are doing a research about Heritage in Yogyakarta, center of Java. 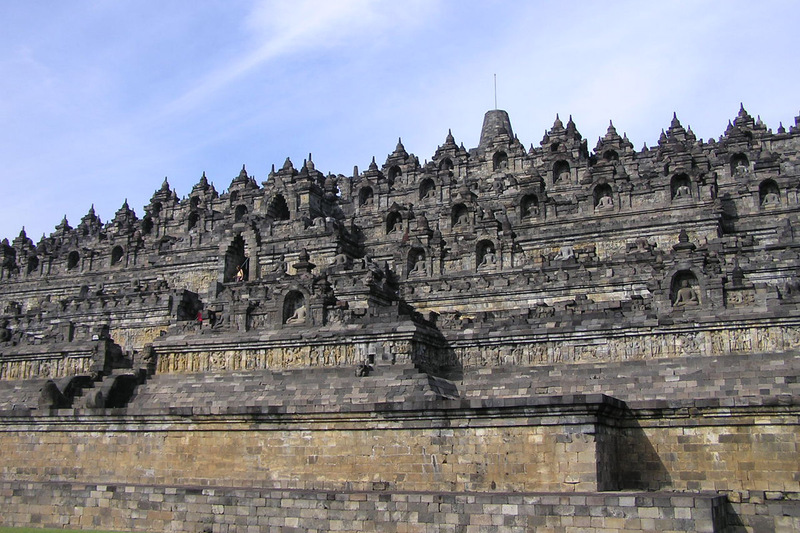 We choose Borobudur and Prambanan to survey how heritage impacted or merged in tourism sites in Indonesia. And we really need your opinions about those two heritages so we could try our best to improve the tourism in heritage sites. Please help us fill the survey form. Thank you for your help!!  Thank you very much!!! All of Students of Graduate Institute of Architecture and Historic Preservation. Hi, I am from New Zealand and was working in Yogyakarta a few years ago. One weekend we went to see this Temple and was very impressed with the stucture and the surrounding parks which were very well kept. The atmosphere there is also good, many people around and very friendly, even to european people. The pictures you have here are excellent and show the Temple and area well – reminds me of a nice period of time in my life. For any body who wants to visit Borobudur temple ,please contact me Maulana, I am local people who live in this area. With my hospitality and friendly I will tell you more about Borobudur temple and I hope you can stay in my house near by borobudur far enjoying village tour. not nice to see at all.